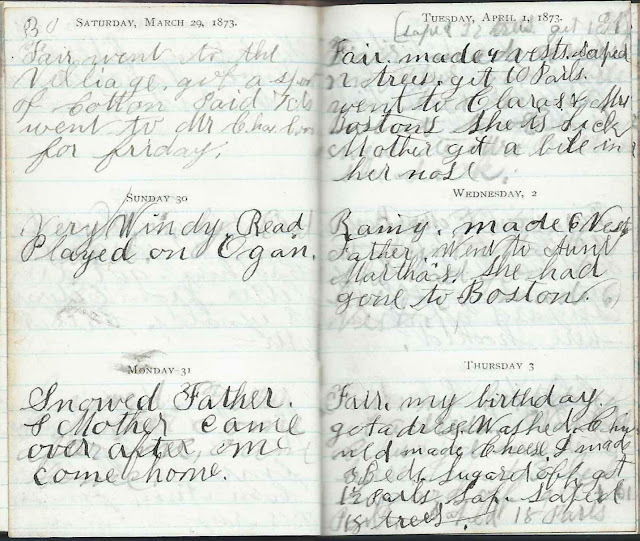 April entries in the 1873 diary of Ida Isadore Reynolds (1860-1946) of Acton, Maine. Ida would marry John Jotham Shapleigh (1856-1923) in 1881. 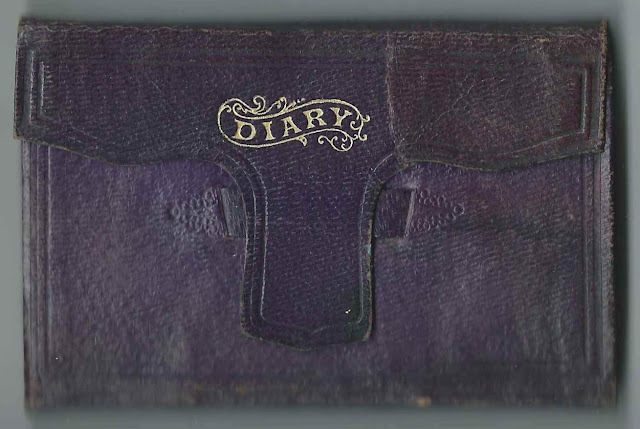 Links to the months of March 1873 and May 1873 appear here and at the end of this post. Saturday, March 29, 1873: For Saturday. [Ida transposed her entries. What shows is an entry for Friday. What I've transcribed shows what she meant to enter for Saturday.] Dull or Very Rainy. Uncle Sawyer finished shelling corn. Aunt finished her rug. Friday, April 4, 1873: Fair. Went to A? [Aphie's or Abbie's ?] Sherman. Got 5 pails [sap]. Callers, Enoch, Andrew F, Mr. Downes. Saturday, April 5, 1873: Fair. Went to Mrs. Boston, got her instrument. Went to Nell's to help, went in woods, get 21 Pails. Sugared off. Clara here, hooked. Sunday, April 6, 1873: Cloudy. Read. Got 3 Pails. 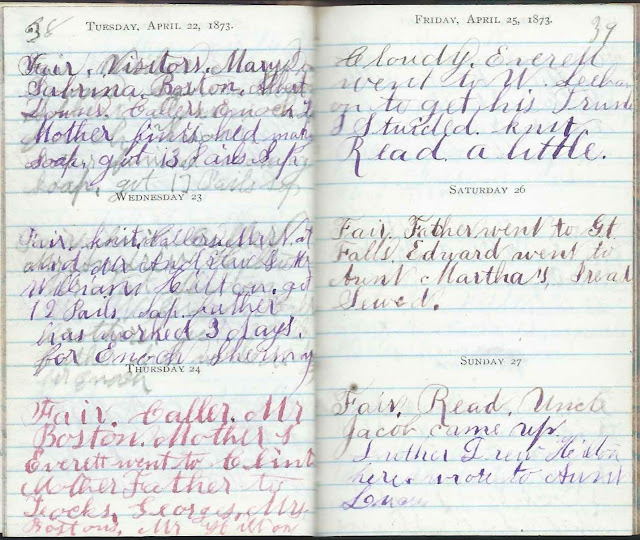 Monday, April 7, 1873: Misty. We hooked all day. Caller, Mr. James Merrel. Visitor, Nellie Hilton, J. Steavens here and Mr. Downes. 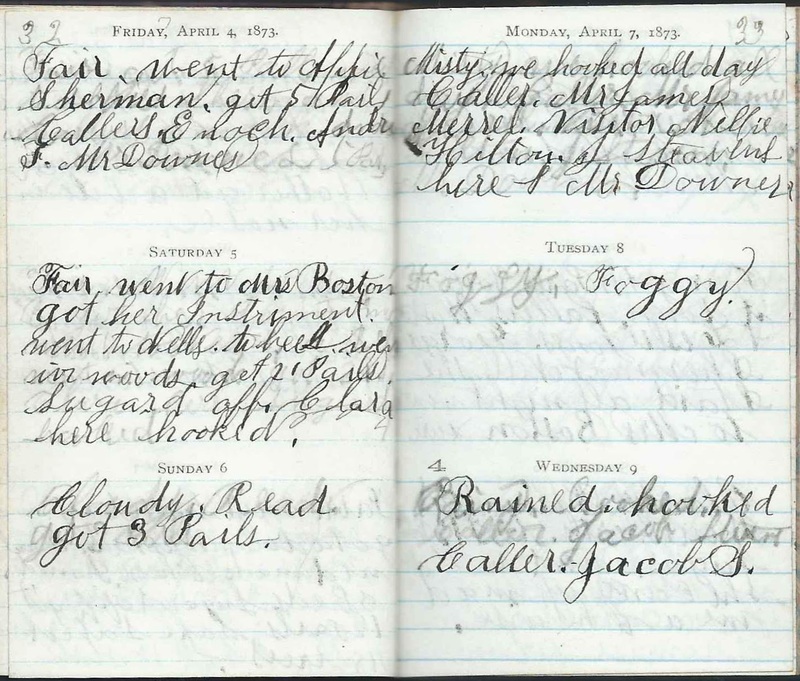 Tuesday, April 8, 1873: Foggy. 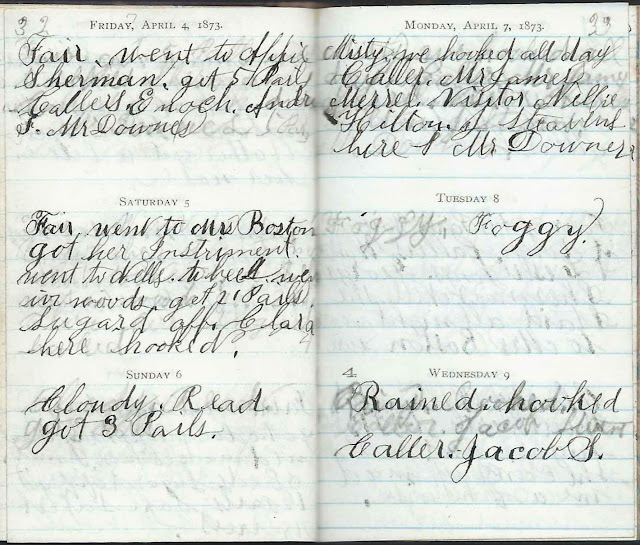 Wednesday, April 9, 1873: Rained. Hooked. Caller, Jacob S.
Thursday, April 10, 1873: Fair. Hooked. Finished my rug. Got _ Pail[s]. Callers, Nell, Mr. N. H., Enoch, Mr. James Merril. 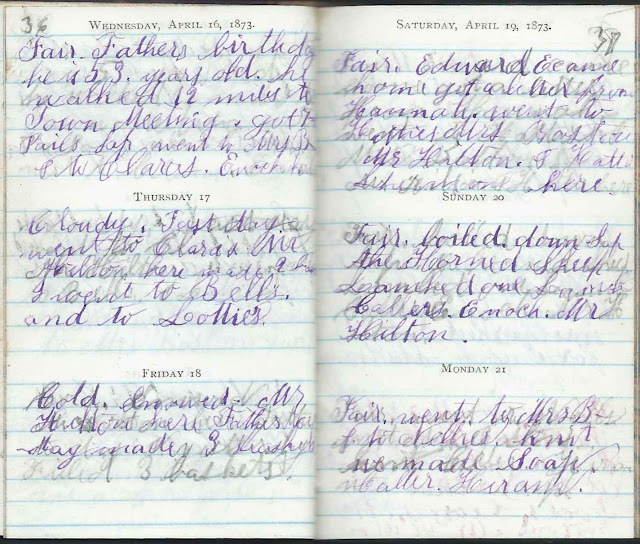 Saturday, April 12, 1873: Cloudy. Snowed. E. A. Wentworth. Boot [bought ?] 1-1/2 Pound Sugar. Went to Hattie's. She came up, made me a chemise. 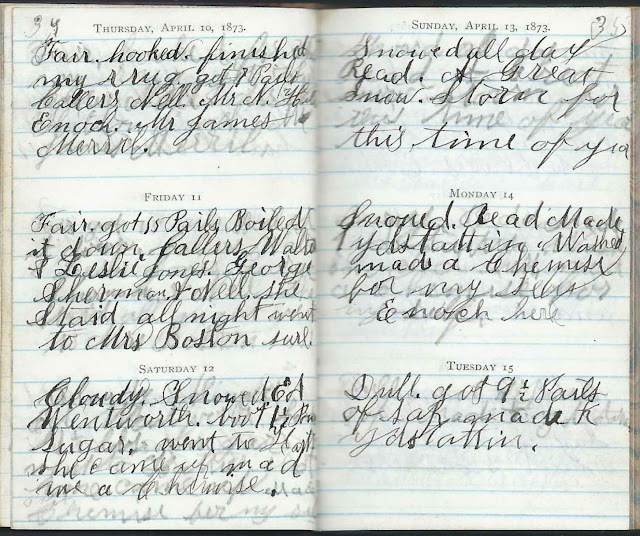 Sunday, April 13, 1873: Snowed all day. Read. A Great Snow Storm for this time of year. 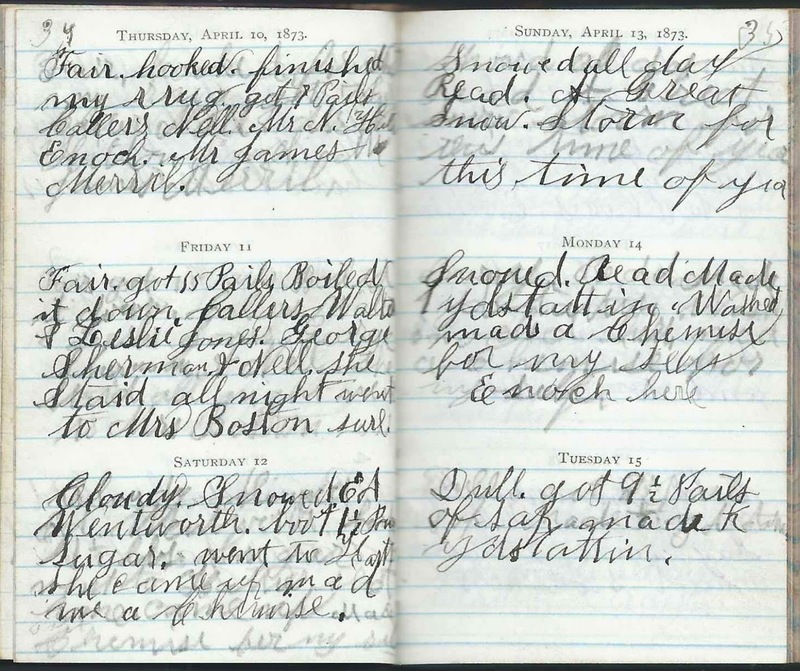 Monday, April 14, 1873: Snowed. Read. Made 1 yds tatting. Washed. Made a Chemise for myself. Enoch here. Tuesday, April 15, 1873: Dull. Got 9-1/2 Pails of Sap. Made ? yds tatting. Wednesday, April 16, 1873: Fair. Father's birthday. He is 53 years old. He walked 12 miles to Town Meeting. Got 7 Pails Sap. Went to Mrs. B and to Clara's. Enoch here. 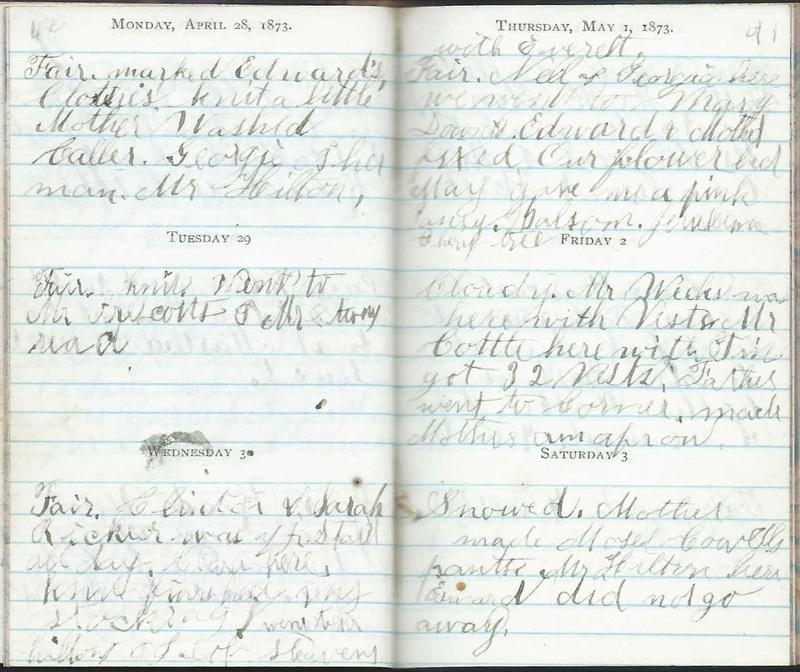 Thursday, April 17, 1873: Cloudy. Fast Day. Went to Clara's. Mr. Hilton here. Made 2 ___. I went to Bell's and to Lottie's. 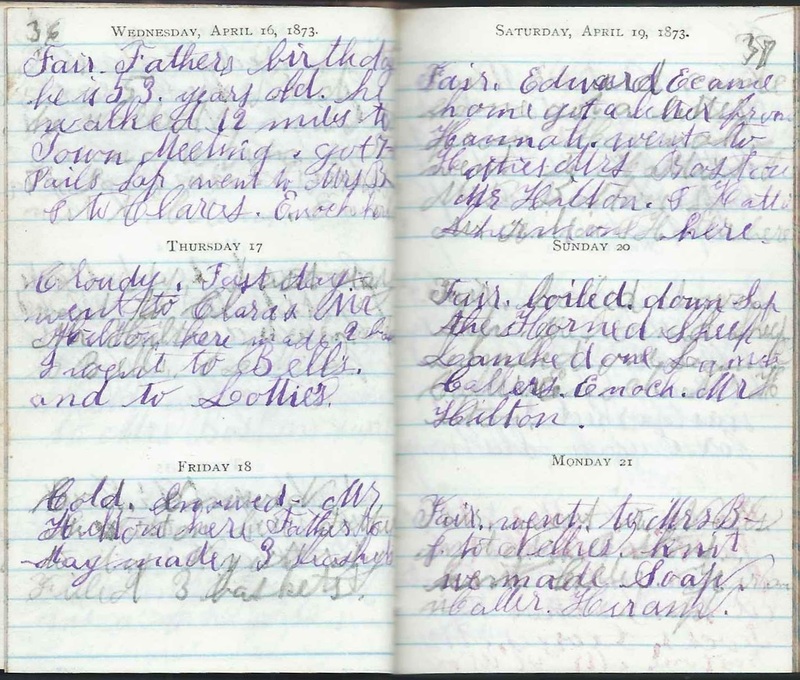 Friday, April 18, 1873: Cold. Snowed. Mr. Hilton here. Father ______May made 3 baskets. Filled 3 baskets. Saturday, April 19, 1873: Fair. Edward E. came home. Got a letter from Hannah. Went to Hattie's. Mrs. Boston. Mrs. Hilton. Hattie Sherman here. Sunday, April 20, 1873: Fair. boiled down Sap. The Horned Sheep Lambed one Lamb. Monday, April 21, 1873: Fair. Went to Mrs. B's and to Nellie's. Knit. We made Soap. Walter, Hiram. Tuesday, April 22, 1873: Fair. Visitors, Mary, Sabrina Boston, Albert Downs. Callers Enoch. Mother Finished making soap. got 13 Pails Sap. Wednesday, April 23, 1873: Fair. Knit. Callers, Mr. Nat ___, Mr. Andrew___ Mr.
William Hilton. Got 12 Pails Sap. Father has worked 3 days for Enoch Sherman. Friday, April 25, 1873: Cloudy. Everett went to W. Lebanon on to get his trunk. I studied. Knit. Read a little. Saturday, April 26, 1873: Fair. Father went to Great Falls. Edward went to Aunt Martha's. Read. Sewed. Sunday, April 27, 1873: Fair. Read. Uncle Jacob came up. Luther Drew Hilton here. Wrote to Aunt Lucy. 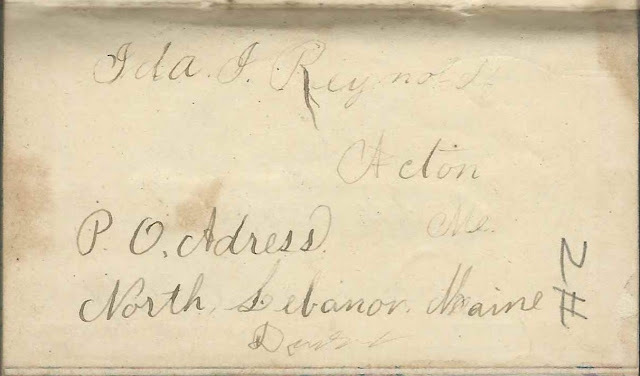 Aphie or Abbie Sherman - If Abbie Sherman, then presumably Abigail Elizabeth (Fox) Sherman (1822-1877), wife of Thomas Sherman (1823-1893) and mother of Ida's friend Harriet Eldora Sherman (1859-1937), "Hattie"
Enoch - Enoch Piper Sherman (1836-1922), husband of Mary (Ricker) Sherman (1837-1889); his first wife, Jane (Guptill) Sherman, had died in 1861. J. Stevens - presumably Jacob Brackett Stevens (1850-1917), son of Hubbard Stevens (1805-1882) and Harriet C. (Brackett) Stevens (1808-1883) and husband of Charlotte M. (Shapleigh) Stevens (1851-1917), "Lottie"
Mr. Hilton - presumably Andrew Hilton (1810-1873), who would die in December of 1873, husband of Eliza Ann (Paul) Hilton (1816-1891); they likely needed help. Advance to May 1873 or return to March 1873.